VOX is Scotland’s national voice on mental health – we represent our members’ views to Scotland’s politicians and health professionals to make sure Scotland’s laws and mental health services reflect service user needs and interests. VOX is Scotland’s only national mental health advocacy organisation run by service users for service users. – advance the general interests of people with mental health issues. 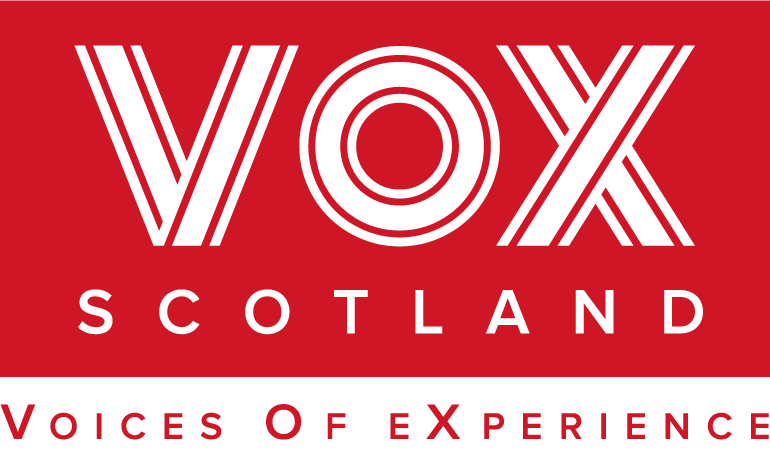 VOX provides collective advocacy at the Scottish national level – representing groups and communities with a lived experience of mental illness – and we also support individuals to form their own groups to express their experiences in their own words. Building capacity is a key part of the VOX mission and we’ve supported user-led mental health groups in Orkney and Aberdeen to get up and running. In some ways, VOX acts as an intermediary between the people, Scotland’s Government and health and social care services. We try to promote a good ‘fit’ between mental health services and laws to ensure that everyone benefits and public money is spent wisely. We don’t provide individual advocacy, counselling, home support or care services – we exist to represent our members’ views at the national level to health professionals and politicians. We don’t have a vested interest in service provision and this enables us to represent our members’ views without referring to financial considerations or a political agenda. VOX represents at the national level across all mental health issues and works in partnership with local/regional groups and thematic mental health organisations (e.g. Bipolar Scotland). We don’t compete with local groups and encourage all our members to think about joining local groups and organisations. Learn more about VOX group members and associate members . VOX is a member-led organisation and any individual with a lived experience of mental illness (past or present) can join – a ‘formal’ medical diagnosis is not required. The VOX Board considers membership applications at its regular monthly meetings and is very welcoming and inclusive – individuals living with mental health issues are often ‘locked out’ of mainstream society and VOX challenges this exclusion. Apply for individual membership if you think VOX might be good for you. Mental health groups led by service users or individuals with a lived experience of mental illness can apply to become VOX group members. Learn more about VOX group membership. Mental health groups led by health professionals, volunteers or carers can apply to become VOX associate members. Learn more about VOX associate membership. VOX members decide VOX priorities at our two national members’ meetings per year and VOX staff implement these priorities on a day to day basis. Our Board consists of twelve VOX members with a lived experience of mental illness plus three nominated members with special expertise in mental health issues. Learn more about VOX governance, the Board of Directors and VOX staff. VOX doesn’t offer individual advocacy and we don’t provide specialist mental health services. We represent VOX members’ views to Government, Parliament, the NHS and wider society and we support and enable VOX members to express their views in their own words. We implement VOX policies decided at our national members’ meetings and undertake research on mental health issues. Learn more about our national members meetings, our AGM, our regional meetings, our capacity building and the VOX BOX newsletter by opening up any of the boxes below. VOX holds two national members’ meetings per year – our September AGM and a Jan/Feb winter event. These meetings establish VOX priorities and we capture our members’ views through inclusive methods. We hold our national meetings in a range of locations (Glasgow, Stirling, Perth, Edinburgh etc) to fulfil VOX’s remit as Scotland’s national voice and all VOX members are warmly invited to attend these meetings. Each national meeting is themed around a major mental health issue, with guest speakers invited to discuss these issues and answer questions. This enables VOX members to learn more about key issues and express their views directly to the individuals who shape mental health policy. Our February 2014 event was attended by the Head of the Scottish Government’s Mental Health Law Unit (Kirsty McGrath) who gave a presentation on human rights and the Mental Health Bill being drafted at that time. After listening to Kirsty, VOX members broke into small groups to discuss her comments before questioning her on the Bill’s human rights implications. Kirsty and her colleague took lots of notes, and we hope that these notes influenced the Bill’s development at Holyrood. VOX members’ meetings address major mental health issues but they’re also friendly and informal. We hope these meetings give VOX members an opportunity to meet and make new friends – it’s good to know you’re not alone in the world! VOX is Scotland’s national voice on mental health and while our office is based in Glasgow, we work hard to represent Scotland as a whole – not just the central belt. To achieve this, we organise one major regional meeting per year to maximise opportunities for VOX members around Scotland to attend VOX events and promote equality of involvement. The 2013 regional meeting was held in Aberdeen and our 2014 regional meeting was held in Moray. The more input we have from VOX members, the better our newsletter will be! VOX is governed by a fifteen-person Board of Directors – 12 elected directors (VOX members with a lived experience of mental illness) and 3 non-elected directors (specialists in mental health issues). The 12 elected directors actively govern VOX while the three non-elected directors provide advice and information when requested. VOX Directors are elected for six years at a time and – following that – they must step down for at least one year before they can stand for election to the Board again. This means that we’re regularly looking for members to step forward and think about joining the Board. Any VOX member can stand for Board membership by nominating themselves as a candidate at the Annual General Meeting, and the candidates receiving the most votes are elected onto the Board. Once a new board is in place, they select four office holders from among themselves (Chair, Vice Chair, Treasurer, Secretary) with one person serving as Chair. The Chair liaises with staff and the other office holders and ensures that everyone gets a fair chance to speak at Board meetings. If there are ever any tied votes at VOX Board meetings, the Chair can cast a deciding vote. The VOX Board meets ten times per year (plus the two national members’ meetings) to discuss VOX business and ensure that VOX staff implement VOX priorities. The Board also considers membership applications, monitors the budget and responds to changes in mental health legislation and policy. In addition to the 12 member directors and 3 non-member directors, four specialist advisors assist the work of the VOX Board. Learn more about our Member Directors, Advisors, Board Meetings, AGM, Memo & Articles of Association, Business Plan and Staff by viewing any of the content below. I joined VOX in 2010 after having a close working relationship with the organisation for several years. Over the last few years I’ve prepared several reports for VOX, mainly because of my background in welfare rights. I’ve helped prepare VOX responses to Department of Work and Pensions (DWP) consultations, mainly relating to Work Capability Assessments and the introduction of Personal Independence Payments (PIP). I’ve also conducted research for VOX and authored the Real People Real Cuts report into the effects of budget reviews and local authority funding cuts on people with long-term mental health problems. I have a fifteen year history of involvement in mental health user groups, with my roots in what was called the ‘survivor movement’. I no longer identify myself as a ‘survivor’, ‘service user’ or ‘person with lived experience’ because – at times – we all survive, we all may need to use services, and we all bring our lived experience of the world around us. I am a person with experience of ill health as well as experience of good health and experience of recovery and relapse. What has always helped along that journey is feeling connected to groups, feeling involved and having space where my involvement and participation is valued. I find the world is often ready to make assumptions, but my own personal background isn’t simple. My family tree shows that I come from a long line of uneducated, itinerant paupers. I was born in Glasgow, went to school in Yorkshire and left with two CSE’s. I wandered around for several years before settling back down in Glasgow. Over the years I’ve been detained, hospitalized, used services and had periods where work wasn’t an option. None of that has featured in the last fifteen years because – in recovery – there’s no end to what is possible. I remarried, started a family, have worked in the UK and had opportunities to work overseas in countries such as Malawi. I have the life I want to lead, it’s not perfect and sometimes I’m not strong, but it is fun. As soon as I was elected to the VOX Board, a friend reminded me I’d said I’d never do such a thing. There are lots of things I’ve said I’d never do, or never have the chance to do. I would never be able to get married, I would never be able to have children, or return to work, I would never matter or find my place in the world. I hear many other people say these things, and VOX has the opportunity to change all this. VOX isn’t about me, it’s about its members and about making the possibility of change possible. My hope for VOX is that it can be a bigger, more encompassing family where everyone feels that they have a space to feel safe and have their say. I joined VOX because I’m a survivor of the mental health system and have been empowered by meeting other survivors, and by being involved in organisations such as Survivors Poetry, Campaign Against Psychiatric Oppression and Survivors Speak Out. I attended the VOX AGM in 2014 and enjoyed the participation, the fact that it’s survivor-led and is open to direction from survivors. Not being listened to can exacerbate or even create mental health problems, so VOX’s approach is very refreshing! In addition to my work with VOX and the survivors’ organisations listed above, I’m also involved with MIND, West Dunbartonshire Mental Health Forum and Mental Health Who Cares (also in West Dunbartonshire). My background is in social work – which I did for nearly twenty years in London and Scotland – and I was involved in my trade union as an elected Convenor and Women’s Officer. I’ve been involved in left wing activism since the 1984-85 Miners’ Strike. I’m a musician and singer/songwriter and I currently run a social enterprise called Sound Inspirations (www.soundinspirations.co.uk) which uses music as a means of healing. I had a good teacher at primary school who encouraged me to play the guitar. Since learning guitar, music has been a great source of comfort, inspiration, pleasure, passion and healing. My dad’s job meant that I moved around a lot as a child, and I’ve lived in places such as Cornwall, Doncaster, Singapore, Libya, Thorny Island and London but I was actually born in Derry in Northern Ireland. I’m also a survivor of child sexual abuse and other childhood traumas. I’ve had several psychiatric diagnoses in the past but I’m not keen on the medical model or on diagnoses as they can lead to stigmatisation and are rather like name calling. We should see the person and their experience and not try to short-circuit the issues with short hand diagnoses which can vary from psychiatrist to psychiatrist and place to place. I’m inspired by the work of Ronnie Laing, the anti-psychiatrist who was hugely influential in the ‘sixties and ‘seventies – I’ve written a song about him and, if you ask me nicely, I’ll sing it for you! Mental health services have improved greatly since they first appeared three hundred years ago but their history is directly linked to the development of capitalism. For example, one of the first ‘mental illnesses’ was called ‘drapetomania’ and the symptoms were “slaves running away from their plantations”!! Not surprisingly, the ‘cure’ was to “put an iron collar round their neck or leg to stop them running away”!! Other equally racist, sexist, homophobic and classist diagnoses followed, and my mission is to end the separation of the ‘mad’ from the ‘sane’ as well as all divisions and the conditions which cause and have caused trauma and distress. This means ending poverty, war, inequality and creating a world which is fair, equal, compassionate and inclusive of everybody. I’ve experienced healing through psychotherapy, homeopathy, music, meeting the right healers at the right time and latterly through mindfulness, meditation and Buddhism. I am passionate about healing and want everyone to gain the confidence to reach their full potential in life. We are all one on our one beautiful planet, so let’s try and create a beautiful future for all! Dr. Alison Thom is a Consultant Psychiatrist and Clinical Director of NHS Lanarkshire South. Originally from Falkirk, she is deeply interested in understanding how things work and – if she hadn’t gone into medicine – would probably have been a teacher or chemical engineer. Alison’s interests include the history of psychiatry, improving medical training and promoting psychiatry as a worthwhile specialisation. Some of Alison’s junior colleagues are astounded by her stories from the past but she hopes that these experiences – good and bad – will help shape services for the future and keep some of the most vulnerable people in our society safe and well. Alison is proud of her VOX involvement and wants good mental health to become everyone’s priority, with a big emphasis on recovery. Alison is married with four children. Kate McCormack is a Team Manager (Mental Health) in North Ayrshire Council’s Social Work Department and advises VOX on Social Work. Ronald Franks is responsible for Legal Services Agency’s Mental Health Legal Representation Projects and a part-time legal member and convener of the Mental Health Tribunal for Scotland. He is a member of the Law Society of Scotland’s Mental Health and Disability Sub- Committee and Adults with Incapacity Specialist Accreditation Panel. He is the lead author of Greens Annotations to The Mental Health (Care and Treatment) (Scotland) Act 2003 and editor of the Mental Health Section of Mays Scottish Social Work Legislation. Maria Docherty is a registered Mental Health Nurse and Associate Director of Nursing for Mental Health and Learning Disabilities in NHS Lanarkshire. Her 28-year career has been devoted to advocating and caring for people with learning disabilities and mental health issues. Elaine Hunter is the Allied Health Professions Advisor for Mental Health to the Scottish Government and advises VOX on all matters relating to Allied Health Professions. VOX is transparent and open and visitors are welcome to read VOX Board meeting minutes to learn more about our work. VOX is transparent and open and visitors are welcome to read our AGM minutes to learn more about our work. Read the VOX Memorandum and Articles of Association to learn more about VOX governance, objectives and membership rules. Read the VOX Business Plan for 2014-17 to learn more about VOX organisational objectives and policies. John has experience as a mental health service user since 1991 and has been a supporter of the Clubhouse movement since joining Scotia Clubhouse in Glasgow in 2001. John has attended many Clubhouse conferences in Europe and the United States and spoke at a fundraising event at the UN in New York. He was also a Faculty Member of the International Centre for Clubhouse Development and, by being involved in the Clubhouse movement, has acquired many additional skills which he uses in his work with VOX. As VOX’s Administration Officer, John looks after the VOX website and issues a weekly update for individual, group and associate members. John also looks after the day to day running of the VOX office and organises major VOX events such as the Annual Conference and Annual Members’ Meeting. VOX staff implement VOX priorities on a day to day basis. Learn more about VOX staff and their areas of responsibility from the profiles below – it’s always good to know who you’re talking to when you call the office!